As though push-ups weren't hard enough, imagine doing as many push-ups as you can until your muscles reach the point of exhaustion. Unlike a test of muscular strength, which is over relatively quickly, muscular endurance tests can last for a minute or longer. These grueling tests measure how many times you can force your muscles to contract before they give up. Not to be confused with a test of cardiovascular endurance, such as a long run or swim which will leave you panting and exhausted, a muscular endurance test incorporates a fair amount of strength as well. 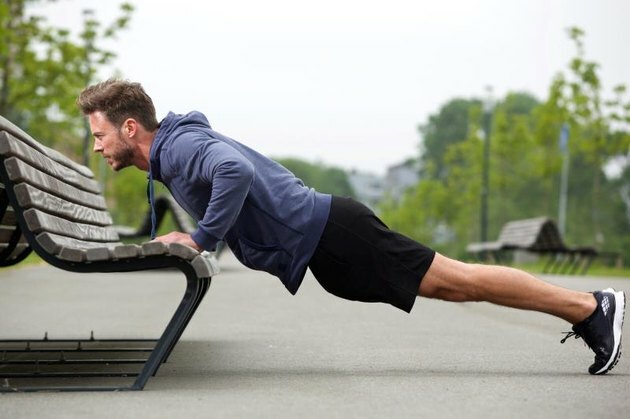 The push-up test is a great example because push-ups require so much upper body strength that you can't perform push-ups continuously for the same amount of time that you could run or ride a bike. Muscular endurance tests are somewhere between a strength test that measures how much weight you can lift and a pure endurance test that measures how long you can run. Push-ups are already difficult for some people, which makes them an interesting choice for a muscular endurance test. 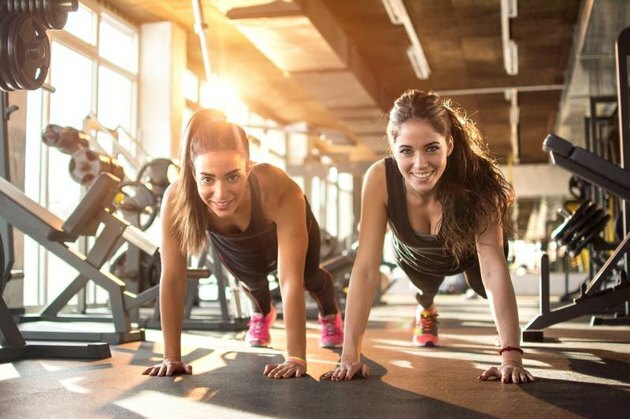 On one hand, people may be able to perform a lot of push-ups and pass a push-up endurance test, such as the ACSM (American College of Sports Medicine) push-up test. On the other hand, someone might not have the strength to perform more than a few push-ups, which means that a push-up test would become a test of muscular strength instead of muscular endurance. In the ACSM push-up test, a grade of "excellent" for a 20-29 year-old male would require over 36 push-ups, whereas the same grade for a female in the same age group would require over 30 push-ups. In this test, women are supposed to perform modified version with their knees on the ground. For the lowest group in the ACSM push-up test -- the "needs improvement" group -- within the 30-39 year-old age group, men still have to complete 11 push-ups and women seven modified push-ups. The problem with the push-up test is that some people may simply not be strong enough to complete the test. For someone who can't complete more than the minimum required amount of push-ups, the test might be challenging their muscular strength more than their muscular endurance. Pure strength is measured by doing as much weight as you can for one repetition, so the closer you get to only being able to do one repetition of something the more it tests your strength, rather than endurance. To increase the endurance of a particular muscle , the first thing to do is strengthen it, explained a 2009 study published in the Journal of Strength and Conditioning Research. Those who struggle at the lower end of the push-up test, would thus benefit from increasing their upper body strength so they can then improve push-up endurance. According to this study, those looking to improve their push-up test should strengthen the muscles involved in the push-up in order to make the movement easier. Strengthening the muscle actually give you more endurance because the stronger you are, the easier the movement will be to complete. The easier the movement is, the more times you can do it, meaning that you have more muscular endurance. Not only should you work on improving your push-up, you should strengthen the pectoralis major, triceps, and deltoids, the three biggest contributors to the push-up. Making these muscles stronger will make the push-up easier and allow you to do more repetitions. The bench press is one of the best exercises for the chest muscles, according to an article in the ACE fitness Certified News, and also works the deltoids and triceps. Dumbbell shoulder presses are an excellent exercise for strengthening the deltoids and triceps. You can use those two exercises to strengthen the chest, triceps, and deltoids, which are the three biggest upper body muscles that are involved in push-ups. These tips may be impractical for people who either don't have enough exercise equipment to perform strengthening exercises for the primary push-up muscles or don't know how to do such exercises. In that case, it is better to keep working on increasing the amount of push-ups that you can do slowly over time. Try doing one more push-up repetition every time you work out. If you increase the amount of push-ups that you can do slowly over time you will be amazed by the amount of push-up strength and endurance that you build up! The influence of strength and power on muscle endurance test performance. How Should Boxers Train With Push-Ups?